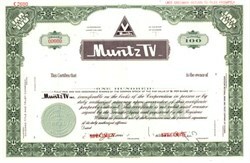 Beautifully engraved RARE SPECIMEN certificate from the Muntz TV. This historic document was printed by the American Banknote Company in the 1960's and has an ornate border around it with a vignette of the company logo. This item has the printed signatures of the Company’s President and Treasurer. This is the first time we have had this certificate for sale. When I say the name "Earl Muntz", what comes to mind? Unless you lived in California in the 1940's or 50's, or you are a true student of pop culture, your most likely response is "Nothing". Too bad, because Earl "Madman" Muntz was one of the most interesting practitioners of the art of hucksterism that America has ever known. He was a self-taught engineer, an outrageous personality, and the inventor of the Muntz Stereo-Pak 4-track system, the direct ancestor of our beloved 8-track. Earl "Madman" Muntz was a former Kaiser-Frazer automobile dealer who had earned his nickname flamboyant advertising and wild deals. His motto was "I buy 'em retail and sell 'em wholesale. It's more fun that way!" Already a national celebrity by the 1950s, he soon jumped from auto sales to electronics, opening a chain of television retail outlets. The sets he sold were manufactured by another of his other firm's, Muntz Television Inc., and they were based on a clever design that saved a few bucks on parts and assembly. 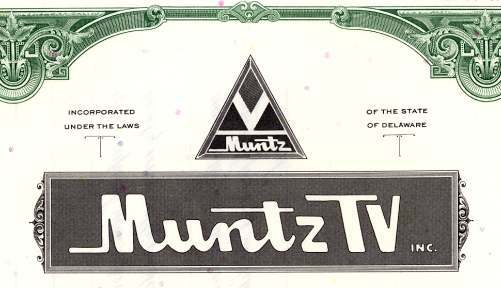 The TV business had its ups and downs, and Muntz went from riches to rags when he landed in bankruptcy court in 1955,and then back to riches a few years later when the market turned around. Car audio was the next world Muntz set out to conquer. In the early 60's, he started producing the Muntz Stereo-Pak, a 4-track system. Bill Lear took a ride in a car with a Muntz stereo in 1963. He was so impressed that he immediately drove over to see Earl Muntz and signed a distribution deal. Lear installed Muntz players in some Lear Jets, and he began taking the players apart and finding ways to improve upon their design. And so the 8-track was born. Earl Muntz died in 1987. At the time of his death, he had shifted the focus of his business to cellular phones. There were many other schemes in between - projection T.V. 's and aluminum houses, to name just two. Muntz was married seven times, and until the end, he drove a custom Lincoln Continental with a TV built into the dashboard (he claimed it helped him to drive better). History from Museum of Engineering.